Thanks to our extensive R&D, brush plating on zinc and zinc based alloys such as Zamak and Mazak is no longer the challenge that it used to be. We have developed a process that involves plating straight onto zinc with a layer of our Copper Strike Brush Plating Solution and then using this as a base for subsequent layers of silver or gold. 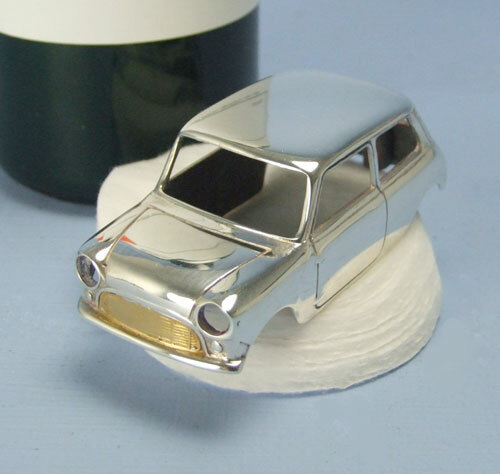 Below is a step-by-step guide on silver and selective gold plating a zinc model of a mini. Plating Solutions; Copper Strike Brush Plating Solution, gold for the selective gold plating, silver. 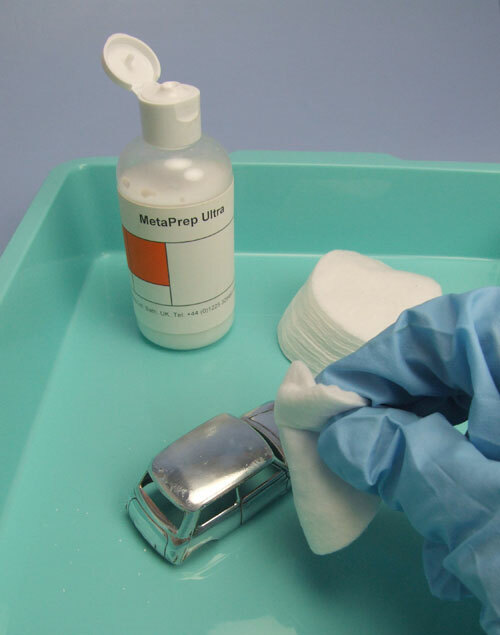 Preparation/polishing solutions; MPU, MetaSeal. 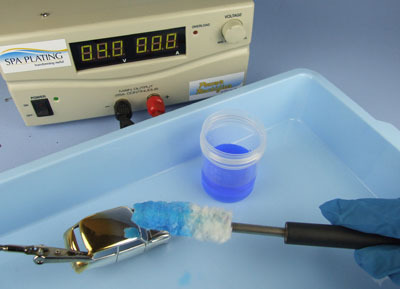 Equipment; a Platinum Electrode for the brush gold plating, a Silver Electrode for the silver brush plating and a Platinum or preferably, a Carbon Electrode for the copper plating, a Plating Pen, an artist’s brush, nail varnish and varnish remover. Polish the zinc to a high shine on a polishing wheel and clean off all traces of polishing compound with MPU. After cleaning with MPU, do not rinse with water, but go straight on with the next plated layer. 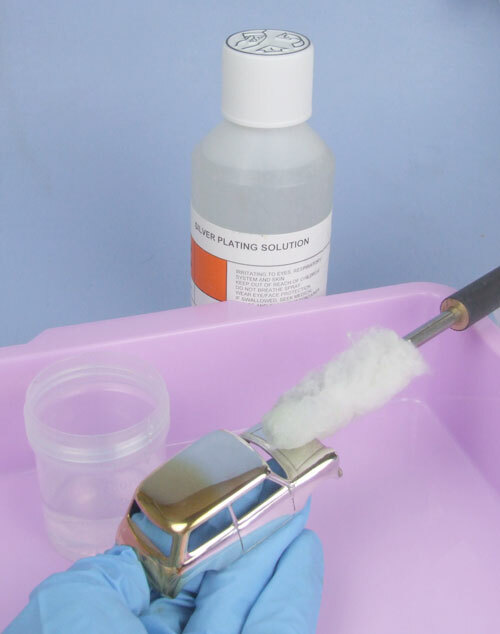 Don’t forget to thicken your Copper Brush Plating Solution first with our Thickener. For further guidance on copper plating, please see our troubleshooting page. After building up a good layer of copper undercoat, you can go straight ahead with silver plating. Carefully mask out the area you don’t wish to be plated with a strongly coloured nail varnish. 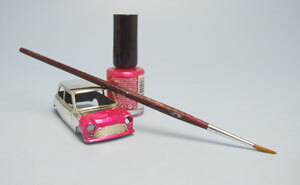 Using an artist’s brush instead of the brush supplied with the nail varnish bottle will enable you to apply the varnish far more accurately. Allow to set in a warm dry place for at least 15 minutes before you start plating. For more guidance on gold brush plating, please see our Introduction to Gold Brush Plating page. 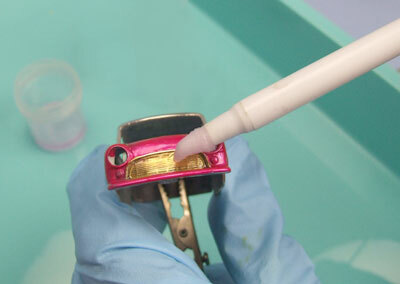 Use the plating pen to carefully apply the gelled gold plating solution. 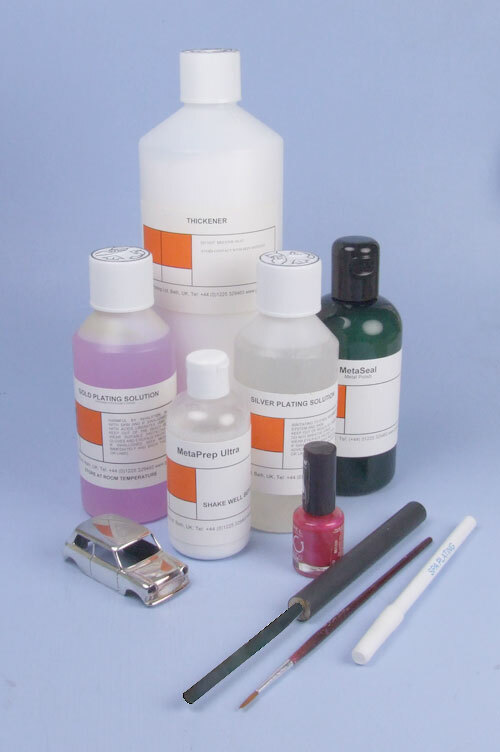 Remove the nail varnish with nail varnish remover and finish the surface with MetaSeal. Can gold be plated straight onto copper or will the copper start to leach through? It is best practice to plate a barrier layer of nickel, palladium or white bronze when gold plating on copper. Gold diffuses back into electroplated copper especially fast.